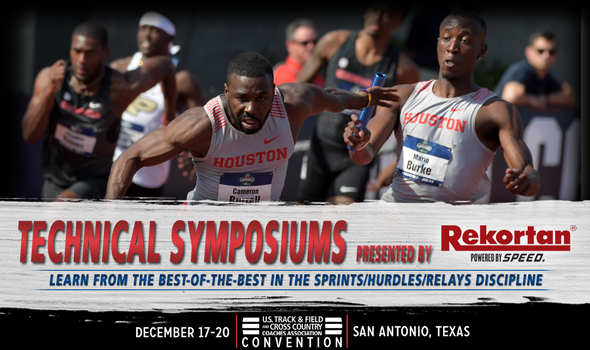 Here is a closer look at five coaches who are scheduled to present Technical Symposiums in the sprints/hurdles/relays discipline. Success followed Doug Case throughout his coaching career. Between his stints at Arkansas and Northern Iowa, Case-coached athletes have collected a total of 186 All-America honors and 12 individual NCAA champions. While with the Razorbacks, Case mentored athletes to the first 60-meter hurdles, 100-meter hurdles, 4×100 relay and indoor 4×400 relay national championships in program history. For a career that’s younger than talented freshmen he coaches, Chris Johnson has had some incredible success since 2002. Over the past 16 years, Johnson has tutored athletes to five NCAA event championships (three individual, two relays) and 61 All-America honors. Johnson-coached athletes have also earned 37 individual conference championships in the Big Ten and SEC as well as 16 relay championships. Chris Parno’s athletes have dominated the NCAA Division II level at Augustana State, where he was from 2010 to 2012 and Minnesota State, where he has been since 2012. Parno-coached athletes have captured 63 All-America honors, including 49 First-Team nods and five individual NCAA titles, not to mention seven Drake Relays titles. This past track season, Parno’s athletes shattered school records in the indoor and outdoor men’s 4×400 relays and the men’s 400 hurdles. According to the Texas Tech website, Calvin Robinson is considered a “jack of all trades” in the coaching community and one look at his accomplishments is easy to see why. Robinson-coached athletes have starred both on the track and in the field. Since he began coaching collegiately, Robinson’s athletes have garnered 63 All-America honors, two individual NCAA championships and totaled three Olympic finals and one Olympic bronze medal. Karim Abdel Wahab has put together an accomplished career at Northern Colorado and Colorado State and is about to embark on his first year at South Carolina. Over his long coaching career, Abdel Wahab’s athletes have garnered six All-America honors, multiple conference and program records, and competed at the 2016 Rio Olympic Games. He has also published several articles discussing the mechanics and methodologies of the sprints and hurdles disciplines and taught extensively throughout North America.